Lara Copper can re-tin your copper cookware, pots and pans. Measure from the rim down one side, across the bottom and up the other side, to the nearest cm. Lids are measured across the middle (Diametre). Depending on the condition of the outside of the pan, we offer two types of surface cleaning. 1. Linishing - Using 180 grit scotch brite wheel. It will produce a semibright finish with light scratch marks on the surface. Cost: including retinning AU$1.75 per cm. 2. Polishing - using soft gloss wheel producing a medium bright finish. Cost: including retinning AU$2.25 per cm. Multiply the total measurement by the appropriate cost ($1.75 or $2.25). Please pack carefully as we reuse the same packing to return the pans. We charge the same return postage fee as you paid sending it to us. Please include your email address in the package. After we receive your copper pan / pans we will email you with the final cost including postage and our bank details. Please click the calculate button to ensure the correct total. 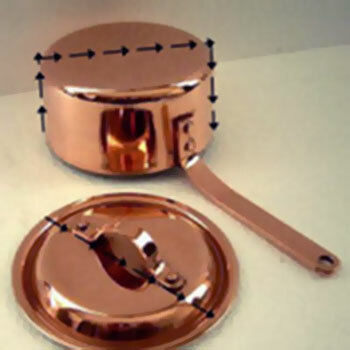 The most common items lost are the lids of pots and pans, we can custom make a replacement lid to fit your pots and pans. Email Lara Copper for a quote, just tell us the inside diametre of the pan, in mm.